A wide variety of igneous rocks occur in the continental lithosphere, a reflection of its heterogeneous nature compared to oceanic lithosphere. In addition, because the continents are not subducted and are subject to uplift and erosion, older plutonic rocks are both preserved and accessible to study. Here we take a different approach than your textbook. While your textbook only considers rocks that are produced in tectonic settings unrelated to plate boundaries, we consider all rocks of the continental lithosphere, some of which were likely produced as a result of plate interactions. We start with granitic rocks and their associated pegmatites, next consider large volume continental rhyolites and basalts, and finish with continental rift valleys. Discussion of kimberlites, carbonatites, anorthosites, and layered gabbroic intrusions is left for your textbook reading pleasure. Here we discuss a group of plutonic igneous rocks usually referred to as "granitic rocks", "granitoids", or loosely as granites. Included are true granites, but our discussion will include all medium to coarse-grained rocks that are mostly felsic with a few mafic minerals. A variety of classification schemes have been proposed for granitic rocks. The easiest to employ uses the modal mineralogy of the rocks, while others attempt classification on the basis of the pressure at which crystallization occurred, the tectonic setting, or type of source rock which melted to produce the granitic magma. Mineralogical Classification. The IUGS mineralogical classification scheme shown here is based modal mineralogy. 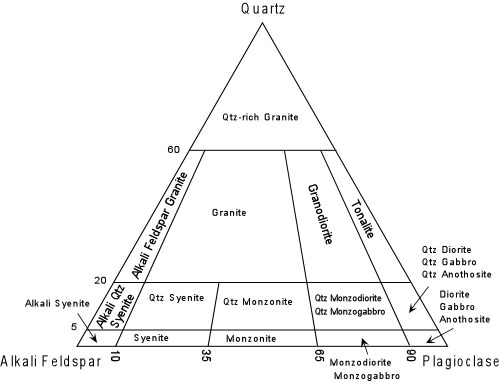 Note that true granites have between 10% and 65% of their feldspars as plagioclase, and between 20% and 60% quartz. All rocks will likely contain mafic minerals such as biotite, hornblende, and perhaps pyroxenes, along with opaque oxide minerals. The base of the composition triangle is a thermal divide, that separates quartz-bearing rocks from feldspathoid-bearing rocks. The feldspathoid bearing rocks include the feldspathoidal syenites, which will not be considered to any large extent here (see your text). Hypersolvus and Subsolvus Granites. Another way of looking at the classification of granitic rocks is based on the feldspars, and whether or not they crystallized under relatively dry low pressure conditions or "wet", higher pressure conditions. This can be seen by comparing the experimentally determined phase diagrams at various conditions. At low pressure under dry conditions, the alkali feldspars form a complete solid solution at high temperature, but, upon slow cooling, they eventually reach the solvus and exsolve into two feldspars, one rich in albite and the other rich in orthoclase. But, because of the low temperature at which this occurs, only single feldspars will occur and these will show a perthitic texture. Granites that crystallize under low pressure and exhibit a single perthitic alkali feldspar are considered hypersolvus granites. At higher pressure, under water-saturated conditions, the liquidus surface is suppressed and the solvus moves up to intersect the solidus. This results in the crystallization of two alkali feldspar solid solutions, one rich in Ab, and the rich in Or. Each of these will further exsolve on cooling to form perthites. Granites that crystallize under these conditions are referred to as subsolvus granites. While this classification scheme may be useful in distinguishing between granites that crystallized at high pressure and those that crystallized at low pressure, the addition of the anorthite component complicates things. Thus, the utility likely only applies to those granites that are poor in plagioclase, or to those that would be classified as alkali feldspar granites under the IUGS classification scheme. Tectonic/Chemical Classification. Tectonic classification is more appropriately called a chemical classification, because, as we will see, the various chemical types are not necessarily restricted to certain tectonic environments. S-type Granites. S-type granites are thought to originate by melting (or perhaps by ultrametamorphism) of a pre-exiting metasedimentary or sedimentary source rock. These are peraluminous granites [i.e. they have molecular Al2O3 > (Na2O + K2O)]. Mineralogically this chemical condition is expressed by the presence of a peraluminous mineral, commonly muscovite, although other minerals such as the Al2SiO5 minerals and corundum may also occur. Since many sedimentary rocks are enriched in Al2O3 as a result of their constituents having been exposed to chemical weathering near the Earth's surface (particularly rocks such as shales that contain clay minerals), melting of these rocks is a simple way of achieving the peraluminous condition. Many S-type granitoids are found in the deeply eroded cores of fold-thrust mountain belts formed as a result of continent-continent collisions, such as the Himalayas and the Appalachians, and would thus be considered orogenic granites. I-type Granites. I-type granites are granites considered to have formed by melting of an original igneous type source. These are generally metaluminous granites, expressed mineralogically by the absence of peraluminous minerals and the absence of peralkaline minerals, as discussed below. Instead these rocks contain biotite and hornblende as the major mafic minerals. Mesozoic or younger examples of I-type granites are found along continental margins such as the Sierra Nevada batholith of California and Nevada, and the Idaho batholith of Montana. In these regions the plutonism may have been related to active subduction beneath the western U.S. during the Meszoic. I-type granites are also found in the Himalayas, which are related to continent-continent collisions. Plutonic suites that were emplaced in convergent continental margin settings, show many of the same characteristics as the calc-alkaline volcanic suite that likely erupted on the surface above. The suites include gabbros, diorites, quartz monzonites, granodiorites, and granites. They show mild to no Fe-enrichment, similar to calc-alkaline volcanic rocks, and a range of isotopic compositions similar to the associated volcanic rocks. Nearly all are I-type granitoids. An example of the a convergent margin plutonic suite is found in the Sierra Nevada Batholith and associated plutons in eastern California and western Nevada that were emplaced during the Mesozoic Era. Exposed rocks are generally older toward the east and southeast. Kistler and Peterman showed that the Sr isotopic ratios vary across the batholith in a systematic way. The younger rocks in the western portion of the batholith are mostly quartz diorites with Sr isotopic ratios less than 0.704, ratios expected from melting of the mantle or young crustal rocks. Plutons farther east are mostly quartz monzonites and granodiorites with ratios increasing along with age of the plutons toward the east and southeast. One interpretation of the data is that the older rocks contain a higher proportion of older crustal material than the younger plutonic bodies. A-type Granites. A-type granites are generally peralkaline in composition [molecular (Na2O + K2O) > Al2O3]. Minerals like the sodic amphiboles - riebeckite and arfvedsonite, and the sodic pyroxene - aegerine, are commonly found in these rocks. In addition, they tend to be relatively Fe-rich and thus fayalitic olivine sometimes occurs. They are considered anorogenic granites because they are generally found in areas that have not undergone mountain building events. Instead, they appear to be related to continental rifting events wherein continental lithosphere is thinned as a result of upwelling asthenosphere. The upwelling raises the geothermal gradient resulting in melting. Young peralkaline granites are found in the Basin & Range Province of the western U.S., and older examples are found throughout southeastern Australia (see Blatt and Tracey, figure 9-13, p. 186). Depth of Emplacement. Because the conditions under which a magma cools can play an important role in the texture and contact relationships observed in the final rock, plutons can be characterized by the depth at which they were emplaced. This is because depth, to a large extent, controls the contrast in temperature between the magma and its surroundings. Catazonal Plutons. The catazone is the deepest level of emplacement, considered to be at depths greater than about 11 km. In such an environment there is a low contrast in temperature between the magma and the surrounding country rock. The country rock itself is generally high grade metamorphic rock. Contacts between the plutons and the country rock are concordant (the contacts run parallel to structures such as foliation in the surrounding country rock) and often gradational. The plutons themselves often show a foliation that is concordant with that in the surrounding metamorphic rocks. Migmatites (small pods of what appears to have been melted rock surrounded by and grading into metamorphic rocks) are common. Some catazonal plutons appear to have formed by either melting in place or by ultrametamorphism that grades into actually melting. Others appear to have intruded into ductile crustal rocks. Most, but not all, Catazonal plutons are S-type granitoids. Mesozonal Plutons. The mesozone occurs at intermediate crustal depths, likely between 8 and 12 km. The plutonic rocks are more easily distinguished from the surrounding metamorphic rocks. Contacts are both sharp and discordant (cutting across structures in the country rock), and gradational and concordant like in the catazone. Angular blocks of the surrounding country rock commonly occur within the plutons near their contacts with the country rock. The plutons generally lack foliation and are often chemically and mineralogically zoned. Epizonal Plutons. The epizone is the shallowest zone of emplacement, probably within a few kilometers of the surface. In such an environment there is a large contrast between the temperatures of the magma and the country rock. The country rock is commonly metamorphosed, but the metamorphism is contact metamorphism produced by the heat of the intrusion. Contacts between the plutons and surrounding country rock are sharp and discordant, indicating intrusion into brittle and cooler crust. The margins of the plutons often contain abundant xenoliths of the country rock. Before considering the origin of granitic magmas we will first discuss the related rocks, the pegmatites, then consider continental rhyolites, which are likely closely related to granitic plutons. Pegmatites are very coarse grained felsic rocks that occur as dikes or pod-like segregations both within granitic plutons and intruded into the surrounding country rock. They appear to form during the late stages of crystallization which leaves H2O-rich fluids that readily dissolve high concentrations of alkalies and silica. Thus, most pegmatites are similar to granites and contain the minerals alkali feldspar and quartz. But other chemical constituents that become concentrated in the residual liquid, like B, Be, and Li, are sometimes enriched pegmatites. This leads to crystallization of minerals that are somewhat more rare, such as tourmaline, [(Na,Ca)(Mg,Fe,Mn,Li,Al)3(Al,Fe+3)6Si6O18(BO3)2(OH)4], beryl [Be3Al2Si6O18], lepidolite [K2(Li,Al)5-6Si6-7Al2-1(OH,F)4, and spodumene [LiAl2Si2O6], which are sometimes found. Rhyolites are much more common and voluminous on the continents than in the ocean basins. They range from small domes and lava flows to much larger centers that have erupted volumes measured in 100s of km3. Most of the preserved volume is represented as pyroclastic flow deposits, often termed "ash flow tuffs" or "ignimbrites. Large quantities of these deposits were erupted during the middle Tertiary in the western United States, northern Mexico, throughout Central America, and on the western slopes of the Andes mountains. The composition of these deposits is usually metaluminous although peralkaline varieties are known. None are peraluminous in composition. Although the recent examples occur near continental margins. Most seem to be associated with episodes of continental extension, such as in Basin and Range Province of the Western U.S. and Mexico. Three Late Tertiary examples are notable. All have formed large calderas associated with the emplacement of pyroclastic flow deposits as well as fall deposits. These include Yellowstone Caldera in Wyoming, Long Valley Caldera in eastern California, and Valles Caldera in New Mexico. Note that all three are located on the margins of the Basin and Range Province. Pyroclastic fall deposits are widespread, although not well-preserved, as would be expected. Ash from the youngest eruptions from Yellowstone occur in sediment cores from the Gulf of Mexico. Ash from Long Valley caldera is found as far east as Nebraska. Eruptions of volumes of ash similar to these would certainly be devastating to any country in which the occurred. As stated above, most of the preserved rocks from these large silicic systems are preserved as pyroclastic flow deposits that spread out close to the eruptive vents. Most display various degrees of welding that results from compaction and annealing of the glassy fine-grained ash particles contained in the deposits. It is the welded portions of the pyroclastic flow deposits that have the greatest potential for preservation in the geologic record, as they are more resistant to erosion. Non-welded pyroclastic flow deposits are usually poorly sorted and poorly indurated. They contain blocks and lapilli-sized fragments of pumice and lithic fragments in a matrix of fine-grained glassy ash particles. Deeper in the deposit heat remains available for longer times and the weight of the overlying material tends to start the welding process. Lumps of pumice become compressed into disc-like forms called fiamme. The original vesicular texture is lost and the flattened pumice loses its vesicular character. The glassy ash particles in the matrix start to weld together, while the brittle lithic fragments are usually not compressed. If temperature remains high and the lower parts of the deposit are under a high load, welding may progress to turn the rock into a vitrophyre, wherein the ash matrix becomes a coherent glass, the fiamme are further flattened and the vesicles and pore space are completely pressed out. Two examples of continental rhyolite complexes will be discussed. 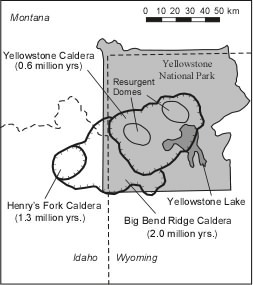 Yellowstone Caldera which occupies most of Yellowstone National Park, is actually the third caldera to form in the area within the past 2 million years. The first formed 2.0 million years ago, producing 2,500 km3 of ash, the second 1.3 million years ago producing 250km3, and the latest 600,000 years ago producing 1,000 km3 of ash. Thus, the repose time is on the average about 650,000 years. That magma is still present beneath Yellowstone is evidenced both by the intense hydrothermal activity that takes place within the most recent caldera, and by seismic profiling which indicates magma at a depth of about 3 km. Long Valley Caldera. Long Valley caldera is located on the eastern side of the Sierra Nevada Mountains in California, along the western edge of the Basin and Range extensional zone. Between 2 and 3 my ago basaltic and andesitic volcanism produced lava flows that filled the down-dropped graben between the Sierra Nevada and the White-Inyo Mountains. Rhyolitic volcanism began about 1.9 m.y. ago and produced lava flows and domes of Glass Mountain. This activity continued until about 0.9 my ago. 720,000 years ago an eruption produced about 600 km3 of pyroclastic material, both as fall deposits and pyroclastic flows. The pyroclastic flows, known as the Bishop Tuff, are still preserved in Owens Valley to south, and in the Mono Basin to the north. Some flows crested the Sierra Nevada and reached the San Joaquin valley to the west. This eruption resulted in the collapse of the area above the magma chamber to produce Long Valley Caldera. The Bishop Tuff shows chemical zonation, having SiO2 concentrations of 77.4% in lower, first erupted units and 75.5% SiO2 in the upper, later erupted units. This likely reflects chemical zonation in the magma chamber. Rhyolite domes and lava flows were then emplaced on the floor of the caldera between 0.73 and 0.61 my ago. During this time the central part of the caldera floor was uplifted to form a structural dome, called a resurgent dome, likely due to re-intrusion of magma below. The resurgent dome shows a central graben on the map above. Rhyolite and rhyodacite domes and flows were also emplaced in the moat around the resurgent dome and along the ring fractures of the caldera between 0.5 my and 0.1 my ago. One of these, Mammoth Mountain, located on the southwestern margin of the caldera, is now a popular ski resort. Between 0.2 and 0.06 my ago basaltic lavas were erupted on the floor of the caldera and in areas to west of the caldera. The most recent activity in the Long Valley area has occurred just to the north at Mono Craters. Here rhyolite domes have been erupted along an arcuate zone that may be a developing ring fracture for another caldera in the near future. In the early part of the century a debate among igneous petrologists ensued concerning the origin of granitic rocks (known as the "Granite Controversy"). One group referred to themselves as the granitizationists and argued that granitic rocks were produced by ultrametamorphism at high temperatures and pressures in the Earth's crust. The other group, referred to as the magmatists, argued that granites were produced by melting and intruded as liquids into higher levels of the crust. The granitizationists used evidence mainly based on what are now recognized as catazonal plutons to make their case. They further argued that making room for such large bodies of magma in the brittle crust would be near impossible and that production of granites in place by granitization of the pre-existing rock would do away with this "room problem". The magmatists argued their case using evidence from mostly mesozonal and epizonal plutons, which clearly show evidence of the intrusive origin of these bodies and evidence that they were liquid when emplaced. Clearly there are several ways that granitic rocks could be produced, but it is highly unlikely that all granitic rocks were formed by granitization, although some catazonal bodies could have been. The fact that contact relations clearly show that many granites were liquid upon intrusion and the fact that large volumes of silicic magma actually erupt in continental rhyolite centers is plentiful evidence for the existence of liquids with granitic composition. The "room problem" argued by the granitizationists is largely solved when we recognize that most intrusive events occur during stages of deformation wherein the stress regime changes from one of compression to extension. Extension of the brittle crust can make the space into which magmas intrude. Nevertheless, it is highly unlikely that large volumes of granitic magma can be produced by crystal fractionation of basaltic magmas. Such crystal fractionation would require initial volumes of basalt 10 to 100 times greater than the siliceous liquids produced. There is no evidence for the existence of such large bodies of crystallized basalt magma in the crust. Anatexis of metasedimentary/sedimentary rocks to form S-type granitic magmas. Anatexis of young crustal basic meta-igneous rocks to form I-type granitic magmas. Melting/Assimilation of lower crustal rocks by mantle-derived basic magmas. Crystal fractionation/Assimilation of basaltic and andesitic magmas. Granitization, wherein high grade metamorphism bordering on melting converts rocks into those that appear texturally and mineralogically similar to granitic rocks. Like the large submarine plateaus discussed in our lecture on the ocean basins, large volumes of basaltic magma have erupted on the continents at various times in Earth history. The most recent of these outpourings, but by no means the largest, is the Columbia River basalts erupted in Oregon and Washington states in the mid-Miocene. Other important flood basalt provinces are listed in the Table below. Qtz -Thol. Oliv. Thol. Alk. Bas. Although each flood basalt province differs somewhat in the composition of magmas erupted, most provinces have erupted tholeiitic basalts. With the exception of a few early erupted picrites in some provinces, the tholeiitic basalts tend to have lower concentrations of MgO (5 - 8%) than would be expected from melts that have come directly from the mantle without having suffered crystal fractionation. Thus, despite their large volume, they are differentiated magmas that are similar in many respects to MORBs. Still, they show incompatible trace element concentrations more similar to EMORBs, and have 86Sr/87Sr and 143Nd/144Nd ratios that extend from the OIB field toward and overlapping with continental crust. This latter feature indicates that they have likely suffered some crustal contamination. The Columbia River Basalts represent a series of lava flows all erupted between 17 and 8 million years ago, with the bulk of the volume being erupted between 16.5 and 14 million years ago. One of the basalt flows, the Roza flow, was erupted over a period of a few weeks traveled about 300 km and has a volume of about 1500 km3. Vents for the eruptions are thought to be a series of dikes located in southwestern Washington. Despite the fact that these lavas appear to be fractionated, they are poor in phenocrysts, and individual flows are very homogeneous in composition. Furthermore, it is difficult to reconcile chemical variation among the various flows to be the result of crystal fractionation processes. Thus, the origin of the Columbia River basalts, as well as most other flood basalts, remains one of petrology's great unsolved problems. A series of Triassic to Jurassic grabens that occur along eastern North America and extend from Canada to Georgia that appear to have formed in a failed attempt to rift North America away from Eurasia/Africa. About 50 m.y. later, these continents successfully rifted apart along a zone further to the East. These grabens are filled with mostly tholeiitic basalts. Another failed rift is the Oslo Graben of southern Norway, of late Paleozoic age. Here, both volcanic and intrusive igneous rocks are exposed. The volcanic rocks consist of an early group of alkalic basalt lavas and a later group of siliceous ignimbrites. The plutonic rocks are also alkaline. One group consists of alkaline gabbros containing alkali feldspar, called essexites, that form dikes, sills, and stocks that apparently fed the basaltic volcanic rocks, and the group consist of syenites and peralkaline granites, all of which contain an abundance of alkali feldspar. Some of these are nepheline bearing while others are quartz bearing. The Rhine graben, between Germany and France is an active rift in which have erupted both silica undersaturated phonolitic ignimbrites along with alkaline trachytes and rhyolites. The East African Rift which extends from Syria in the north to Mozambique in the south has been active throughout the Cenozoic. During the initial stages of rifting fissure eruptions produced large volumes of basalt and siliceous ignimbrites. During the late Miocene and Pliocene these eruptions became more focused, and produced shield volcanoes consisting of basanites, rhyolites and phonolites. In Plio-Pleistocene times rhyolites were erupted along the main axis of the rift, while basalts continued to be erupted on the plateaus adjacent to the rift. Quaternary volcanoes along the axis of the central rift zones, in Kenya and Tanzania consist of phonolite, trachyte, or peralkaline rhyolite. This province illustrates the wide variety of unusual rock types found in continental rifting settings. Note, however, that parts of the rift along the Red Sea and Gulf of Aden have evolved to oceanic ridges and produce MORBs to form new seafloor. The alkaline rock series found in many rifting areas are very unusual, and far less common than the basalt - andesite - dacite suites found in other environments. We here discuss how some of these unusual magmas might have come into existence. We have already discussed how low degrees of partial melting of the mantle at higher pressure can produce silica-undersaturated basaltic magmas, while increasing degrees of melting, or melting at lower pressure tends to produce silica-saturated to oversaturated basaltic magmas. Once such magmas have evolved to the point where they begin to crystallize alkali feldspar, we can see what would happen by looking at the simple three component system Ne-SiO2-Ks (kalsilite). Note that in this system, the join Ab -Or forms a partial thermal divide at low pressure, and separates Silica oversaturated compositions from silica undersaturated compositions. Imagine that a silica-saturated basaltic liquid has evolved to a silica-oversaturated trachyte. Continued fractionation of alkali feldspar solid solution from such a trachyte would cause the liquid to change composition toward the minimum in the sub-system Ab - Or - SiO2, eventually crystallizing quartz and producing a rhyolitic liquid. On the other hand, a silica undersaturated basaltic liquid that has evolved to a silica undersaturated trachyte will change in the opposite direction with alkali feldspar crystallization, and eventually reach a phonolite composition crystallizing nepheline, or leucite + nepheline at the minimum in the silica undersaturated part of the system Ab- Or - Ne - Ks. This is further illustrated by looking at a total alkalies versus SiO2 diagram, showing the approximate compositions of various alkaline rock types. Also shown is the approximate position of the critical plane of silica-undersaturation. Note how a slightly silica-saturated basalt will evolve through hawaiites, mugearites, benmoreites and trachytes that will eventually continue to produce rhyolites. While a slightly silica-undersaturated composition will follow a similar path, but eventually produce phonolites with decreasing SiO2. Note how small amounts of crustal contamination of silica-undersaturated basalts could also cause these silica-undersaturated magmas to become silica-saturated, and result in the bifurcation of the trends. Thus, upwelling of the mantle beneath the continental rift zones likely results in various degrees of melting of the mantle by decompression melting. The presence of continental crust, favors small amounts of contamination of these already alkali rich magmas resulting in the production of basalt-trachyte-rhyolite suites. Basaltic magmas that reach low pressure and are still silica-undersaturated results in basalt-trachyte-phonolite suites. Only small changes in composition of the original mantle-derived magmas are necessary to produce these diverging magma types. Peralkaline rhyolites are common in continental rift settings, although they also occur in oceanic island settings, and our discussion here includes such settings. In nearly all cases, peralkaline rhyolites are associated with mildly alkaline silica-saturated basalts, hawaiites, mugearites, and trachytes. The question becomes - why are peralkaline rhyolites produced instead of normal metaluminous rhyolites? One answer could come from fractional crystallization of plagioclase. Ca-rich plagioclase contains twice as much Alumina as the alkali feldspars, and very little alkalies. 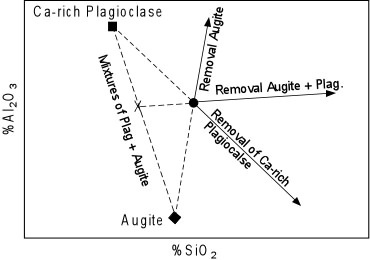 Thus removal of Ca-rich plagioclase will result in depletion of Al and enrichment of Na and K (as well as Si). This is termed the "plagioclase effect". (Recall that peralkaline rocks are those that have a molecular amount of Na2O + K2O > Al2O3). On the other hand, if a ferromagnesium phase with high Ca, but little Al, such as augite, also fractionates, then Al depletion will be minimized with increasing Si, thus offsetting the plagiocalse effect to produce normal metaluminous rhyolites. Compare and contrast I-type, S-type, and A-type granitic rocks. Compare and contrast Catazonal, Mesozonal, and Epizonal plutons. What are pegmatites and how do they form? What are welded pyroclastic flows and how do they form? In the "Granite Controversy" the granitizationists argued that large volumes of siliceous magma could not be stored in the crust. What is the best evidence against this argument? What rocks suites and rock types are found in continental rift valleys? What is the plagioclase effect and how does it explain the origin of peralkaline rhyolites? What are the most predominant basalt types found in continental flood basalt provinces and how do they differ from MORBs?